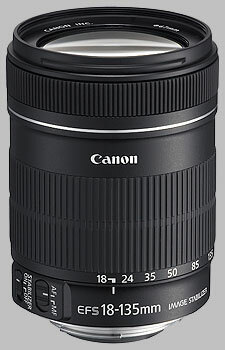 The Canon EF-S 18-135mm ƒ/3.5-5.6 zoom lens was announced alongside the 7D camera in September 2009. A petal-shaped lens hood is available for but does not ship with the lens. The lens is available now for around $400. Looking at the lens at its widest aperture settings, it performs quite well for the price tag. Wide open at ƒ/3.5 at its widest angle of 18mm, the lens is sharp in the middle, tapering out to slightly soft corners; zooming in to 24-50mm produces even sharper results, even wide open at ƒ/4-5 at those focal lengths. At 85mm corner softness ramps up quickly, while still providing a sharp center; the corners are actually slightly better at 135mm than 85mm, both of which offer an aperture of ƒ/5.6. Stopping down the lens improves sharpness results across all focal lengths, and the optimal sharpness settings are 50mm and ƒ/8, where the lens is tack-sharp across the frame. The effects of diffraction limiting are noticeable by ƒ/16 (at 50mm and wider, it's noticeable by ƒ/11) but even then images are still quite sharp at 50mm and lower. At ƒ/16 and 85-135mm, we note some slightly softer images. Fully stopped-down performance is fair at wide angle, average at 50mm, and quite soft at 85-135mm. CA is noticeable as magenta-green fringing on edges of high-contrast areas, at wide and telephoto focal lengths: in the mid-range, between 35mm and 50mm, chromatic aberration is quite well-controlled. Below 35mm, CA is controlled slightly better with the lens used at wider aperture settings rather than stopped-down; above 50mm, it really doesn't make a difference what aperture you use. Corner shading is only significant when the lens is used with wider aperture settings; the worst-case scenario sees the corners 2/3 EV darker than the center when the lens is used at 18mm and ƒ/3.5. At any other setting wide open it's less than that, and with the exception of 18mm, any other focal length stopped down to ƒ/8 or smaller essentially produces no light falloff. The complex array of lens elements that allows the range of focal lengths in this lens leads to some dramatic results for distortion. When used in the wide angle configuration, the lens provides uniform barrel (''bloat'') distortion up to around 21mm, with dramatic distortion in the corners (1.25%, quite significant). After 21mm, distortion across the frame remains consistently barrel-distorted, but at a moderately low level (around 0.2%, on average) and the extreme corner distortion turns into the pincushion (''squeeze'') style. The worst pincushion distortion shows at 35-50mm, where the corners show -0.6% pincushion distortion. Post-processing would be required to correct for these effects. The Canon 18-135mm ƒ/3.5-5.6 IS is not a USM lens, with AF being driven by a DC motor and gears. As a result the lens focuses fairly fast, but is noticeably slower than a USM lens. As well, the lens makes a slight, low frequency whizz as it focuses. Manual focus override is unavailable while the lens is set to autofocus operation: in order to focus manually, autofocus must be overriden with the ''AF/MF'' switch. With a reproduction ratio of 1:4.8 (0.21x), the 18-135mm has fair macro capability, but it won't replace a macro lens any time soon. Its minimum close focusing distance is 45mm (just under 18 inches). At 16 ounces, the Canon 18-135mm ƒ/3.5-5.6 IS makes a light package for the versatile range of focal lengths it offers. To accomplish this the lens is largely plastic, though it is of a high-quality construction. The lens mount is metal, and the 67mm filter threads appear to be plastic. There is no flexing or rattling when using the lens: the exterior of the lens has a spatter-painted appearance, while the lens barrel, visible when the lens extends towards 135mm, are smooth. The only information available on the lens are marked focal lengths: there are no distance scales or depth-of-field indicators. The lens only has two switches to speak of: one to enable or disable autofocus (''AF/MF'') and one to activate or deactivate image stabilization (''Stabilizer ON/OFF''). Image stabilization works as advertised, providing several stops of steadiness in our hands, though as always the actual usefulness is going to depend largely on the capability of the individual camera user. There is a very slight sound when image stabilization is active, but mostly only audible when your ear is next to the lens. The large zoom ring is the prominent feature of the lens, at just over 1 1/2 inches in width. The rubber texture is a series of raised ribs that provide an easy grip. The zoom action is smooth, going from 18mm to 135mm in a ninety-degree turn, with only a minor amount of force required to transition between focal lengths. The lens extends as it is zoomed out, adding an extra 1 1/2 inches to its overall length. Zoom creep was not a factor in our testing with this lens. The focusing ring is mounted near the front of the lens, with a rubber ridged knurl that is easy to turn. The lens really isn't built for manual focus: the ring is only a half-inch in width, and doesn't offer much in the way of travel for manual focus operations (less than ninety degrees of turning action). The ring turns during autofocus operation, and can't be overridden in this mode: you must specifically disable autofocus to override the focus clutch. Note that while the focusing ring turns, the front element does not, so attached filters will stay in place during focusing operations. The focusing ring ends in hard stops at the close-focusing and infinity ends, and we cannot tell if it can focus past infinity. The optional EW-73B lens hood is petal-shaped with a bayonet-mount, but we can't comment on its usefulness as it doesn't come with our test sample. For a few dollars more this lens extends your reach to 200mm, and does it surprisingly well; sharpness results for this lens were slightly better than the 18-135mm, though unsurprisingly results for distortion and corner shading are slightly worse, given the range the lens has to cover. Chromatic aberration is handled the same, if not slightly better, than the 18-135mm. For about the same price Sigma offers its own superzoom, with performance that is similar to the Canon 18-135mm for the ranges it covers. It's as sharp if not sharper in the mid-range up to about 80mm; above that, there is some extreme corner softness. CA is handled slightly more poorly, especially at the extremes. Results for distortion follow much the same pattern, and corner shading is handled much better in the Sigma. Technically, the Sigma 18-125mm ƒ/3.8-5.6 DC OS HSM is a closer match to the focal lengths, but we haven't yet tested this lens. Tamron's superzoom offers the most wide-angle to telephoto reach of any superzoom, and its most recent update offers a new focusing motor technology which we haven't yet reviewed. The Tamron covers the same range and then some compared to the Canon; wide open, the Tamron is almost as sharp as the Canon, but not quite; stopped down, they're on par. The Tamron handles chromatic aberration quite well, at least in the same range of focal lengths as the Canon 18-135mm; light falloff is also fairly negligible, and distortion is typical for the superzoom category. With the array of lenses available to service this range of focal lengths, there's no clear reason to pick this particular lens over other choices, such as Canon's excellent 18-200mm superzoom, or a 15-85mm & 55-250mm combination (or, for that matter, superzooms offered by Sigma and Tamron). That said, owners of this lens should be more than satisfied with the performance it offers. I bought this lens with the Canon 60D, and I use it on a 40D for the imaging company I work for. My work needs a zoom and I chose this over the 17-85mm that I sold recently. My backup lens to the 18-135mm is actually the 18-55mm. I like the lens because of the zoom range, you can go wide at 18mm and lengths for portraits @ 50, 85, 135mm. The only downside is that the aperture gets smaller so you might not have the DOF like their primes. Sharpness is decent. Autofocus was average. Aside from street photography, I did use this for a night softball game. What happened was that I shot games a season ago and I used the 55-250mm (also reviewed), but this new season I didn't have a real "telephoto lens". The best I had was this 18-135mm. Luckily I had the 60D so I was able to crop some photos since the 135mm wasn't long enough. With that said, I guess it's a below average lens for sports if: the field is small, you don't mind walking around to get closer to the subject, have a high MP body to crop, and if the game was in daylight. For anything else, this lens is pretty good. Stabilization is great. Has some correctable distortion. I bought this lens to replace my 17-85mm which developed a problem with the aperture assembly(a common problem with that lens), I also have a Canon 18-55mm is lens but wanted something with a little more reach. The build quality is a step up from the 18-55mm but maybe not as good as the 17-85mm, in terms of image quality it is balanced nicely with the zoom range making it a very useful walkaround lens. Autofocus is swift despite it not being USM, and it seems quieter and quicker than the 18-55mm. All in all a good lens for the price. Hasiendo comparaciones me parece mejor que el EF-28-135 f/3,5-5,6 IS, Tanto en construcción como en calidad de imagen y con un mejor rango focal. Canon EF-S 18-135mm IS is an affordable all purpose lens designed especially for Canon beginner digital SLR camera users. The built quality are very similar to Canon Rebel XS, XSi and T1i body. It does not feel heavy and too long. Focal length of 18-135mm (equivalent to 29-216mm) is very versatile. It is wide enough for indoor or long enough for outdoor. There is no USM (ultra sonic motor) in the lens, so it will make a a bit of noise when the lens auto focus is activated. AF is moderately fast and very good for everyday use.